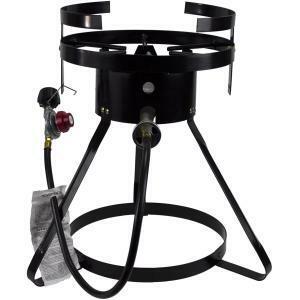 The Chard Burner, Stand & Regulator kit allows you the flexibility to deep fry, boil steam, even brew, anywhere. All you do is add the pot, the fuel and the food! Great for backyard cookouts, camping trips, or tail-gating at the big game. Featuring a powerful 50,000-BTU cast iron burner and a CSA-approved regulator and hose, this unit also includes an 18-inch tri-pod stand for maximum stability. Whether your cooking the Sunday family meal or the Thanksgiving main event, Chard gives you the tools to make it yours! Cast iron & Aluminum. Black.